Being entirely unequipped to comment on the musical quality of Pop-up Opera’s Le Docteur Miracle, Civilian Theatre found itself both perplexed and perspiring in hipster paradise Drink Shop & Do – a location that clearly thinks that what it lacks in circulating air can be made up for in aggressively twee interior design. The production can be seen as part of the continuing rise of the small-scale opera; a surprisingly niche success story even by the standards of a city that has managed to revitalise shops that specialise solely in knitting, cupcakes and inept service. The movement has being gaining ground since 2009 and the great success of OperaUpClose’s genuinely fantastic La Boheme, which lead to the company gaining a residency at The King’s Head Theatre in Islington where they went on to produce programmes that combined interesting work with variable quality. Rather than establishing a permanent base, Pop-up Opera appear to have taken the form of the travelling players that have decided their form would be comic operas rather than morality plays. Le Docteur Miracle hearteningly plays for one-night-only in locations where London is merely a distant blight on an OS map; for every Hackney Wick and Dalston there is an evening performing to the good people of Herefordshire, Cornwall and Sussex. A travelling production brings with it logistical challenges. Each venue is likely to be prepped only hours before the show and so a slightly rough-and-ready approach to the proceedings is only to be expected, and in this case forms part of the production’s immense charm. The cast work hard to actively draw the audience into proceedings and there is an undeniable pantomime feel to some of the evening, which may offend the purists but arguably puts at ease those less comfortable with the whole concept of opera. That is not to say that it all works; the short get-in combined with the unraked seating leads to some major issues with audience sight-lines. There were some moments that were probably lovely but as they had been staged at the same level as the seated audience it meant all that could be seen was a sea of trendy haircuts. However the story-telling was impeccable. Not being able to follow librettos when they are in English, it would certainly have been challenging to follow Bizet’s French. However the artful staging of the surtitles was an excellent touch. 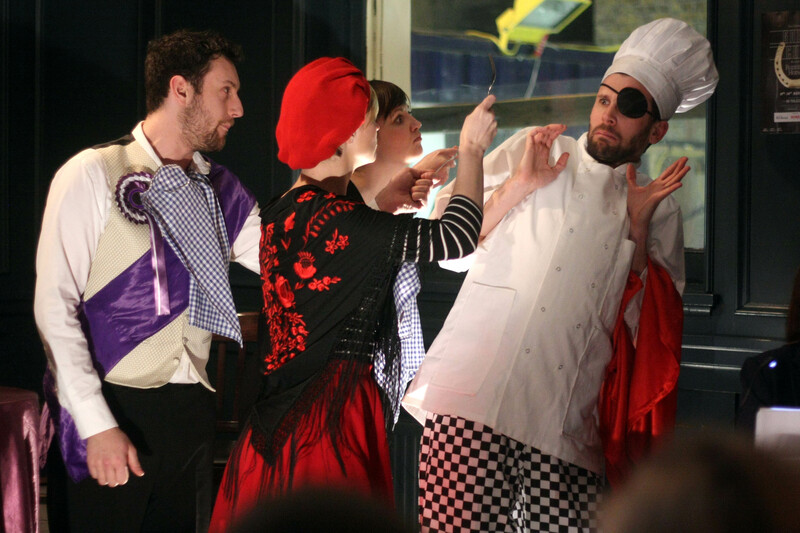 Eschewing the classic libretto of the original, there is a real verve to how Pop-up Opera have taken it forward. Bizet’s classic story has been updated to the 21st century; it blends internet-era visuals and memes with witty takes on current affairs to create a plot that even opera philistines – like this reviewer – could follow without resorting to the programme synopsis. A nice touch is that it also tips a nod to its French roots by using silent film period captions to provide enough dialogue to cue the audience. Sometimes the jokes may be a little broad and the merest hint of subtlety is usually buried under the next piece of slapstick but this charge may well have been thrown at Bizet’s original given it was written when he was just 18 years old. Critics may argue that something has been lost by so radically reworking Bizet’s text but it is questionable that it would work without doing so. The original came across as modern and shocking to a contemporary audience but it seems sensible to consider that relying on topical French 19th century reference points to amuse an audience in 2014 may have been pushing it. 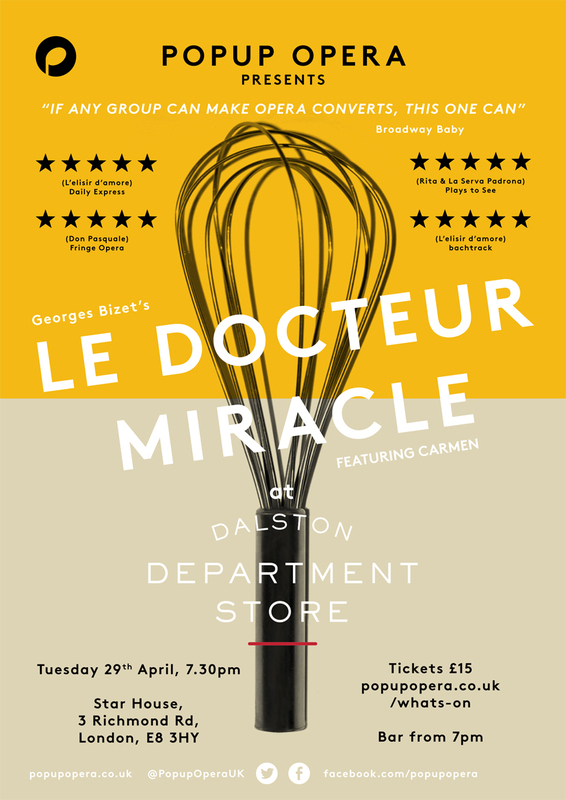 Pop-up Opera’s Le Docteur Miracle is, by any measure, a deliciously absurd confection that delights in providing fleeting satisfaction but is ultimately devoid of lasting nourishment. Yet do we criticise it for this? Should we ever expect, or want, anything more from it? In celebrating its very existence and its role in the pursuit of human happiness, the late Kenneth’s Clark described opera as ‘one of the strangest inventions of western man’ and, borrowing from a probably apocryphal quote from Dr Johnston, that it is ‘an extravagant and irrational entertainment’. I know far less about opera than Kenneth Clark but I know enough to suggest that Le Docteur Miracle updated for the 21st century, borrowing from Carmen, performed with four singers and one musician (and some over-enthusiastic tambourine playing audience members) in a bar in Kings Cross is surely an example of completely irrational entertainment and as such should be welcomed.